If you are either a landlord or letting agent, one part of your remit will be to provide maintenance services for the garden or landscaped areas around your properties. To achieve this, you’ll be looking for a trusted and reliable partner to undertake the required work, leaving you with one less area of concern. 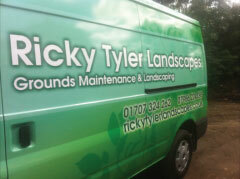 Why Ricky Tyler Landscapes should be your preferred solution? With more than a decade of experience servicing more than 1,500 properties, we will develop a specific weekly, fortnightly, monthly or annual maintenance service schedule tailored to the needs of your rental properties. When delivering this, we will work at regular and convenient times, using our branded vehicles and clearly uniformed staff, so that residents appreciate the efforts you are making on their behalf. Where possible, we will use the same team on each visit, providing for a continuity of service. We have also introduced our Ricky Tyler Landscapes quality control procedures and spot-checks, ensuring our work reaches the high standards you would always expect. We also undertake complete CRB checks on every team member, and have all the necessary health and safety, public liability and employers' liability insurance policies in place. 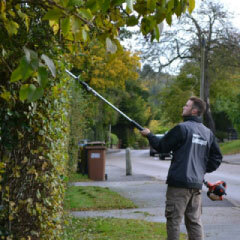 Finally, our environmental commitment means that we also remove all garden waste produced as we work. It’s then recycled and composted where possible. We offer a free consultation about all your rental property garden needs. Every situation is different, so call us now on 01707 324 262 or 07986 224 09 for a free discussion about your needs. We can deliver professional grass cutting, weed control, mulching, hedge trimming, and leaf and litter clearance services as part of your unique, cost-effective service package. We guarantee to meet any like-for-like quotation, and can provide references as required. If you prefer, use the contact form to the right and we’ll quickly call you back. Ricky Tyler Landscapes can provide gardening and grounds maintenance services including Rental Properties Grounds Maintenance covering London, Essex, Hertfordshire, Northampton, Buckinginghamshire & Bedfordshire .